You can download this episode and others by subscribing to The Road to Now on Apple Podcasts, Google Play, and Stitcher. The great eclipse of 2017 is has captured Americans’ imagination, and millions of Americans are planning to travel to catch a glimpse of this rare event. This got us thinking- how have Americans’ responded to similar events in the past? Fortunately, we were able to speak with historian Steve Ruskin, who has been researching this topic for years. Steve explains the reasons that eclipses excite our imagination, the ways that people have understood eclipses throughout history, and the parallels between the 2017 eclipse and America’s first great eclipse in 1878. 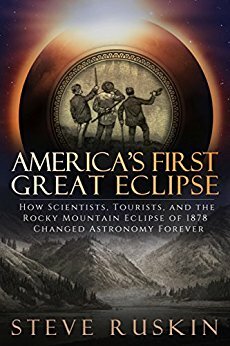 Dr. Steve Ruskin is a historian of science whose new book America’s First Great Eclipse: How Scientists, Tourists, and the Rocky Mountain Eclipse of 1878 Changed Astronomy Forever was published in May of 2017. To learn more about the book or purchase your own copy, click here. This episode was brought to you with support from our sponsor, Ramseur Records.